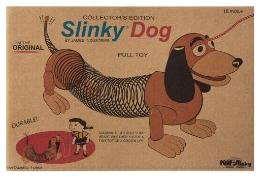 Retro Slinky Dog Just $11.99 Down From $22! You are here: Home / Great Deals / Amazon Deals / Retro Slinky Dog Just $11.99 Down From $22! Oh! This caught my eye! Ok I wasn’t born in the 50’s but, I may have owned one of these! lol You can get this great Retro Slinky Dog right now for just $11.99 down from $22! Remember this from Toy Story? Toy history was made when Richard James conducted an experiment with tension springs. During the experiment, one of the springs fell to the floor and began to “walk”. The Slinky debuted 1945 at Gimbals Department Store in Philadelphia, Pennsylvania and all (400) Slinkys for sale were purchased in 90-minutes. Since then, over 300-million Slinkys have been sold worldwide. The Slinky is filled with nostalgia and has been featured in Disney Pixar’s “Toy Story” movie franchise. It’s the official state toy of Pennsylvania and famous for one of the most popular jingles of all time, “It’s Slinky”. Though it was developed to be a toy, the Slinky was used by soldiers in Vietnam as an antenna and a therapy tool for hand-eye coordination.